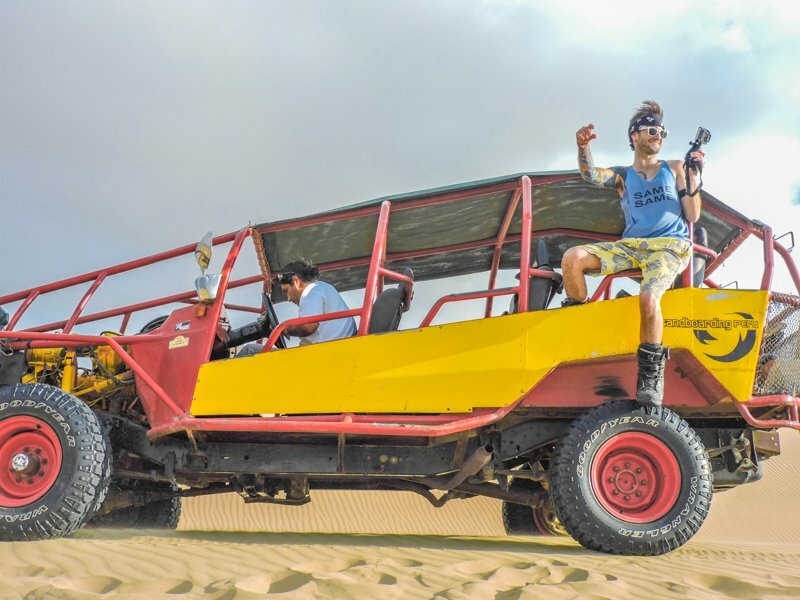 Did you miss our last article on Huacachina? Let me describe this area for you. Huacachina is a town with a desert lake which is surrounded by sand dunes. It’s home to lots of hostels for travellers to stay in. At the weekend it is a party town, this changes during the week. 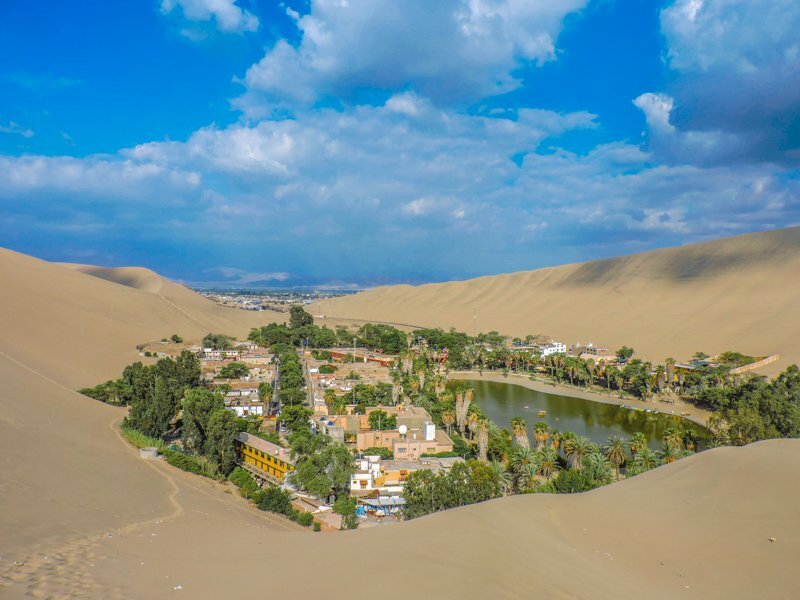 Huacachina – this is not a mirage! 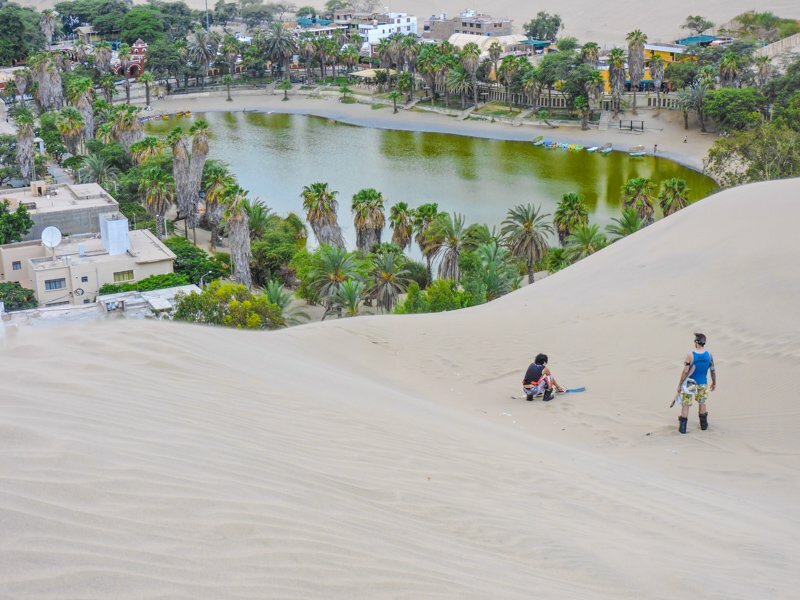 Every hostel (and bus company) in Huacachina will offer you a sandboarding experience – if you want the ‘real deal’ don’t choose them. Make your way to Sanboarding Peru next to Hostel Del Barco. If Alejo is there, tell him Two Scots Abroad sent you and you want the ‘same same but different’ from snow, sandboarding experience! 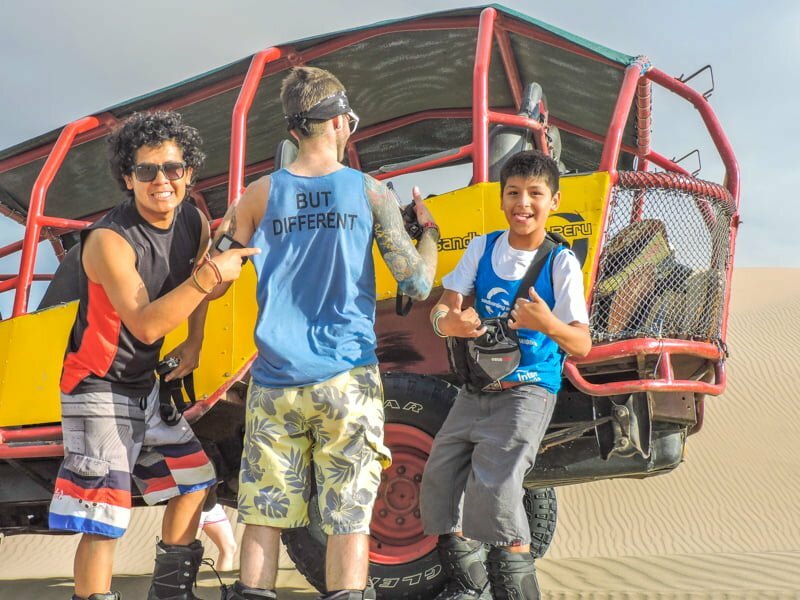 Both Sandboarding Peru and the generic sandboarding tours offer a dune buggy ride, which is a lot of fun! This bumpy ride up and down the dunes, makes you lose your stomach to the hills. It’s excellent for those with GoPros/X-Sports action cams. The main difference between the two is in the equipment and action. The generic companies mostly provide you with a low quality board, sometimes the boards will have socks / ‘boots’ attached. This type of sandboarding is ideal for those who simply want to tackle the dunes sitting on the boards, so using it like a sledge. It might be of use for travellers who want to try boarding for the first time, albeit accidents can happen. I wouldn’t recommend this unless instructed well. I know our bus tour guides at Peru Hop advise you not to stand up! 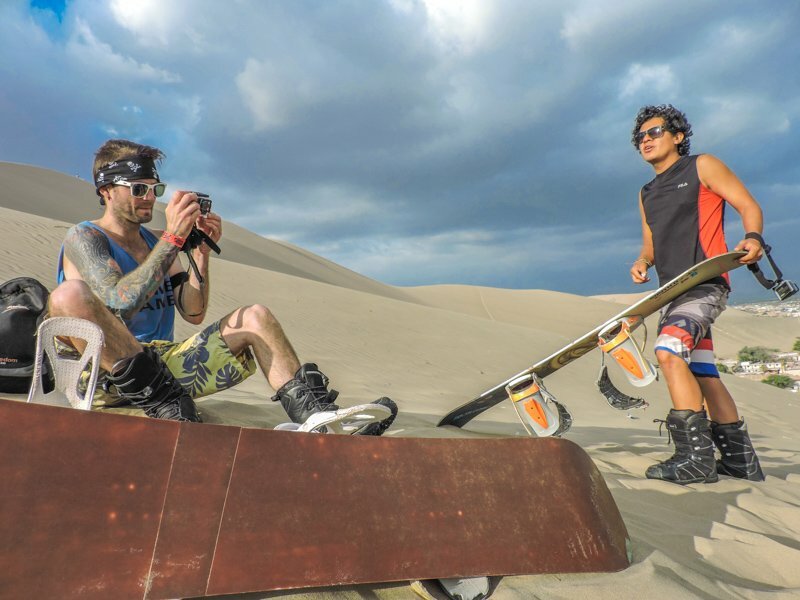 Sandboarding Peru will measure and kit you out with boards with boots and depending on your package, skis. Alejo, us Two Scots, and one of the kids from the club, Jhonny, trekked up the side of a dune (this was quite tough, the hardest part of the day). Alejo then taught us how to use the sandboard facing away from the dunes, using our heels to stop. The first time I tried boarding on sand it was tense! I fell a lot, my body refusing to relax. The second and third time, we flew down, still falling! Falling on sand is not the same as falling on snow, much softer and no freeze burn. Alejo also instructed us on how to use the board facing the dunes, using our toes to stop. I found this more difficult but Craig was a natural. A dune buggy (with another group completing the ‘normal’ experience) collected us and this is where we experienced the fairground style driving! All you can hear on the dunes is joyful screams (there are heaps of touristy style companies out at the same time). Next stop – skiing! I could tell Alejo was a bit unsure about me skiing since I have only skied once before on snow (Craig is a bit of a pro). Not to worry, once I remembered how to actually get into the skis I slowly (very slowly) made my way diagonally down the dune using the ‘French fries’ (horizontal legs) not ‘pizza’ (crossing the skies into themselves) method. The coolest part was skiing towards the end of the dune – as the wax wears off towards the end of every ride (you need to replenish) it naturally stops you so I could ‘bomb it’ (as Craig calls it), without fear, down the dune. Looking back up at the dune I thought to myself, it’s a mystery we made it down. One of the most surprising parts of the trip was the amount of time we spent on the slopes. Quite a few fellow travellers were jealous of our ‘real’ sandboard and ski experience. Sandboarding Peru have three areas to their business model. As a teacher, it was encouraging to see the work the team do with the local children. There were young kids in the office, helping with the equipment. They normally hit the dunes at the weekends, which we missed unfortunately. Alejo says it’s mostly boys who participate and commit, a couple of girls join them less frequently. He reckons it’s mainly down to stereotypes, which he’d like to see change. The competitive part sets them aside from other companies too. Part of the team is Victor ‘Dito’ Chavez, the only Peruvian pro – snowboarder! Sandboarding Peru also puts on competitions for kids and adults to participate in; they want to get them hooked with their young and develop that passion as they grow up. It was a privilege to listen to Alejo speak about the school in this way. Regardless of (around about) 28 degrees heat in Huacachina, they still took part in World Snow Day! Sand and snow boarding – same same but different! 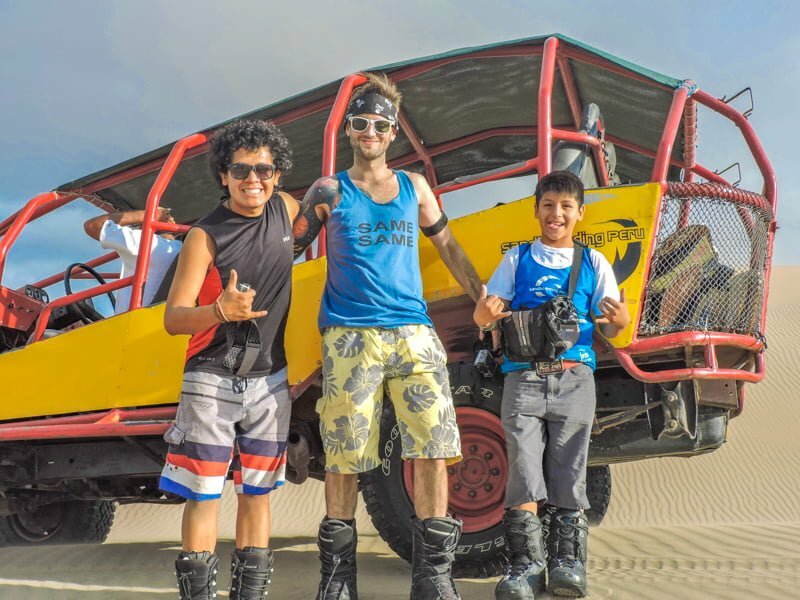 Check out Sandboarding Peru on Facebook and give them a like. 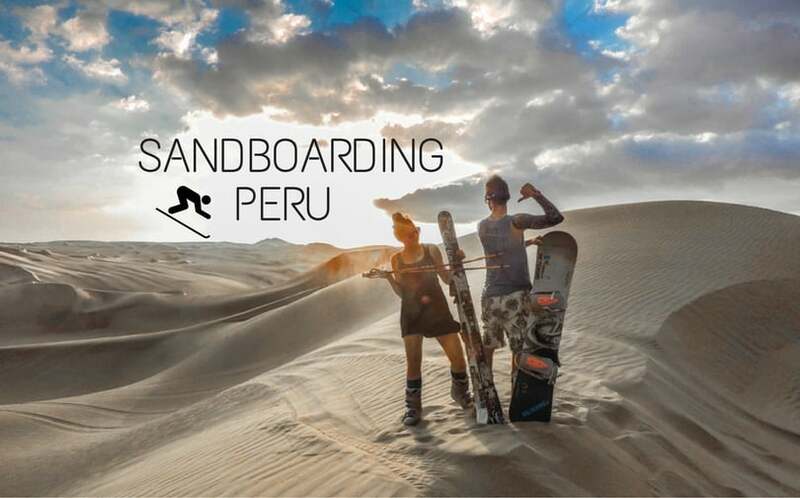 Sandboarding (or skiing) is one of the ‘must do’ things to do during your travels around Peru. For more details on Peru tips, itineraries, transport, accommodation, and culture see this Peru travel guide.